ONLY those who laboured on the Island in the early years can appreciate the vast changes which have taken place. 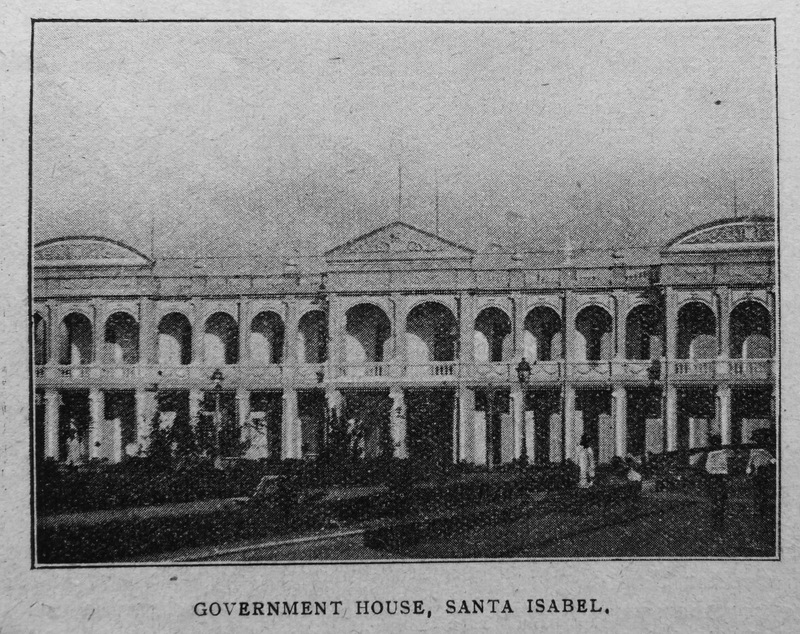 Santa Isabel, the chief port, has developed into a town of considerable size and importance. It can now boast of substantial stone buildings, a well laid out plaza, where the townspeople assemble and the band plays of an evening time. A railway runs up from the beach into the town and is connected with the line that is being constructed across the Island to San Carlos Bay. One can get now within two hours‘ journey of our Bottle Nose and Baticopo Missions. A weekly Launch Service connects by sea Santa Isabel and San Carlos Bay. The Spanish Steamers now regularly run round to the Bay to pick up cocoa and carry passengers. 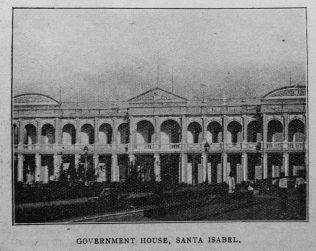 Santa Isabel is well supplied with fondas or refreshment rooms, and whereas in the early days the town missionary was dependent upon tinned provisions, he can now order either lunch or dinner, and have it brought to his table fresh every day. The long journeys by boat are an experience of the past. Only to Banni are we compelled to go by water and even to this mission a primitive road has been cut through the bush, which is largely used by the natives. For our purpose we shall still find it necessary for some time to come to travel to this place by boat. Our people are comfortably settled in good houses, some of them very substantial, with cocoa farms in different parts of the island. Much more of the bush and tropical jungle has been cleared for a considerable distance up the mountain, and the process of clearing is still going on, all making for the improvement of the health conditions of the island. Our Mission premises and grounds occupy a most prominent position, overlooking the lovely Bay and methinks in recent years the Spanish officials and other traders must have looked with longing eyes on this estimable site which has been increasing in value year by year. With the improvement of the town our church has kept pace, and in spite of restrictions and difficulties is enjoying its palmiest days. Our people are among the wealthiest inhabitants of the island and the spirit of generosity is conspicuous among them. We have four Class-meetings and a Catechumen Class during the week. Our C.E., a comparatively new venture, and started by the Rev. G.E. Wiles, is one of the largest and strongest in Primitive Methodism. Any number from one hundred to one hundred and fifty is the average attendance week by week. The young folks shoulder their responsibilities and give papers and addresses which will compare very favourably with those given at home. We have a flourishing Sunday-school, and the congregations at the services on the Sabbath are large and enthusiastic. Financially and numerically we were never better than now, and we owe a great debt to our missionaries of past days for sowing seed which is yielding such a rich and glorious harvest. San Carlos Bay Mission has also developed with the advance of the times. The strenuous labours of the Rev. H.M. Cook, carried on with energy and power by the present missionary, Rev, W.H. Collins, have changed the mission into a moral and spiritual hive of industry. Bottle Nose gives promise of great things in the near future. Rev. C. Finlay, with his genial disposition and large-heartedness, is gathering round him a loyal and devoted band of workers. This mission may yet be said to be in its infancy, in fact, we should call it a young people’s mission. We wait with patience and yet with a glad assurance that, in the not distant future Bottle Nose will become one of the most aggressive centres of religious work on the island. Baticopo will always be associated with the honoured name of Maria Showers, a consecrated and devoted worker, attempting often-times more than her physical strength will allow. She has done a good work in spite of many difficulties, a work which will abide and be a star in her crown of rejoicing. Banni has suffered from the long absence of a resident missionary, but is still holding on its way. It has a warm place in my heart. I have been responsible for it since January last, and each month I have paid a visit extending over the greater part of the week. 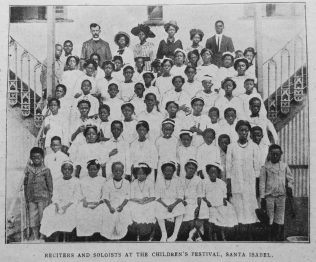 They are the best singers on the island, and the young people are keen, alert and intelligent, and the eagerness with which they welcome any opportunity of mental and spiritual training is an evidence that the work of Rev. W. N. Barleycorn is bearing precious fruit. 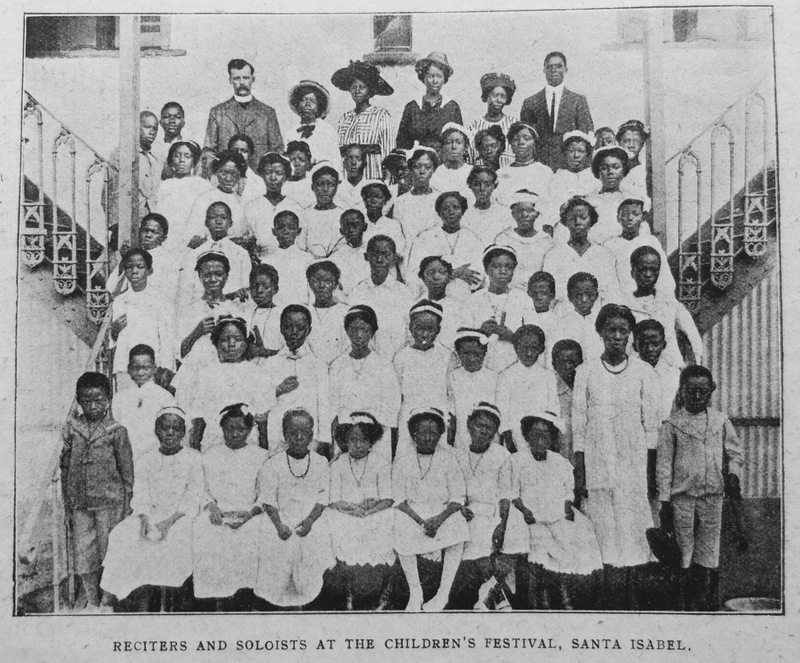 Few missions could have survived the ordeal to which Banni has been subjected, but they are holding bravely on, and eagerly anticipating the time when a missionary shall dwell among them. A fine opening presents itself here for an enterprising and consecrated worker. The mission is well situated and the people are most loyal and devoted. Since writing the above, the English steamer has arrived with Rev. J. Nicholls on board, so the days of waiting for Banni are over. After a few days in town, I accompanied him by launch to Banni. News had been sent overland of his arrival. “The people gave him an enthusiastic welcome. The verandah of the old mission-house had been decorated with palm leaves and bright red flowers, and the effect was very pretty. Mr. Nicholls will never forget his introduction to these Banni people; they almost shook his hand off, words were few, for the heart was too full for speech. The character of his reception is a happy augury for the days which lie before him. Our industrial work on the island in the past has contributed a great deal towards our present success, but whether we are justified in continuing that work under present conditions is a matter for serious consideration. In the early days we employed our own people, we taught them how to plant and grow cocoa, and we secured for them Government grants of land which they now hold. 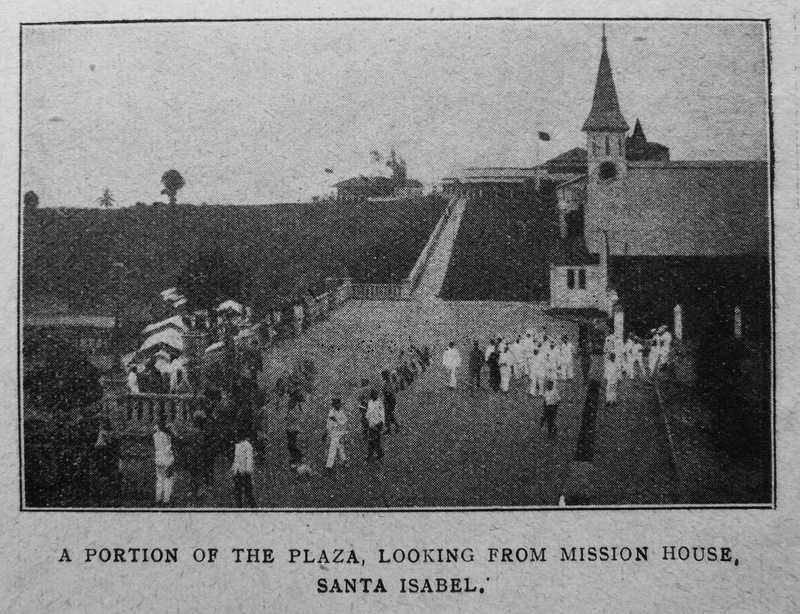 Their services are now lost to us, and all the labour necessary for our mission farms has to be imported, so that our industrial work at present is entirely on a business footing, and the financial returns from it do not warrant the expenditure of time and energy which it necessarily involves on the part of the missionary. The time is coming and not far distant, when he will be compelled to concentrate more and more on the medical, practical, and religious work of our mission centres, and cocoa growing must cease. It has had its day and served its purpose, it must now drop so that a man may give all his time and energy to the higher calling and to the particular work for which he has dedicated his life. Primitive Methodism in Fernando Po is distinguished by its fervour, its generosity, its simple faith. Class-meetings are still a precious institution of the church, to hear some of our women pray is a rare treat, their testimonies are rich in thought and feeling, the Sabbath singing lifts one into heaven. If the effectual fervent prayer of the righteous availeth much the missionary is well favoured, for his welfare is always their heart’s desire. We miss some of the old familiar faces. Mamma Job, Daddy MacFoy, and Daddy Price, but others are still with us, some of them too old and feeble to walk to church, they are waiting on the borderland, listening for the call; in the meantime they hold up our hands by prayer, and in the quiet of the home refresh their souls by memories of the past.